Last semester seemed like a whirlwind. My academic workload consisted of 4 courses: Health Promotion and Wellness, Adulthood and Aging, Occupation-Centered Programs for the Community, and the Mental Health immersion. 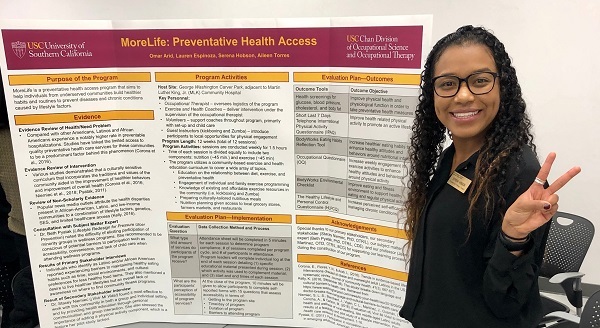 Apart from classwork, I also completed my Level I Fieldwork at USC’s Kortschak Center for Learning and Creativity, tabled and advocated for OT at various events such as the Latino Expo Event, and held the role as a Care Team Coordinator for the Student Run Clinic. One of my biggest accomplishments was attending two conferences. 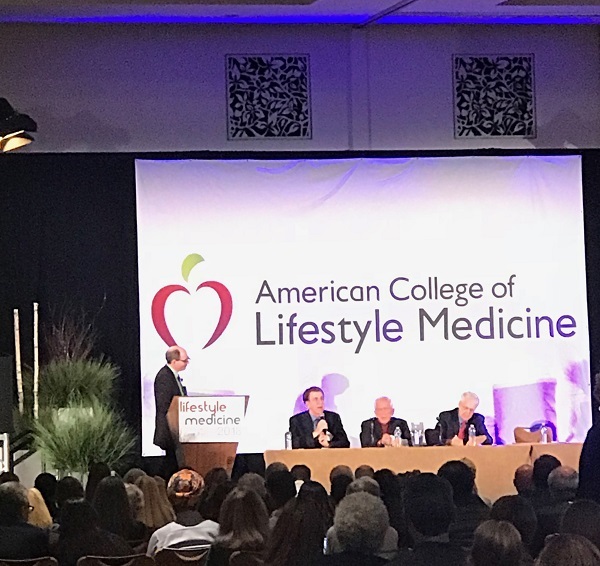 I previously mentioned the OTAC conference in Pasadena, California and I would love to tell you more about the second conference I attended: the American College of Lifestyle Medicine (ACLM) conference in Indiana. What is the American College of Lifestyle Medicine (ACLM)? The American College of Lifestyle Medicine (ACLM) is a a healthcare association dedicated to preventing, managing, and reversing chronic diseases with lifestyle interventions. The ACLM healthcare professionals strive to place a greater emphasis on helping clients sustain healthier lifestyles such as engaging in health promoting diets, regular physical activity, adequate sleep, stress management, and avoidance of substance and drug misuse. My top 5 reasons for attending the ACLM conference. 1. Further my education in lifestyle medicine: Attend seminars and lectures led by renowned healthcare professionals in the field of Lifestyle Medicine (LM) like Dr. Caldwell Esselstyn, Dr. Colin Campbell, Dr. Dean Ornish, and Dr. Wayne Dysinger (whose wife happens to be an OT ). Panel of guest speakers at the 2018 American College of Lifestyle Medicine Conference in Indiana. From left to right: Dr. Michael Gregor, Dr. Dean Ornish, Dr. Colin Campbell, and Dr. Caldwell Esselstyn. 2. Learn about and advocate for OTs role in LM: At the conference I was the only individual in the field of OT. It is an amazing feeling to be able to advocate for our profession in the growing field of LM since we are trained to address lifestyle changes with a focus on habits and routines. 3. Focus on my passion: I love being able to combine my interests with my profession. 4. Meet and connect with other healthcare professionals with the same interests: One of the highlights of the event was being surrounded by people who not only wanted to help others live a healthier and happier life but they too were practicing a healthy lifestyle. For example, all of the food at the conference was whole food plant-based and a 5k walk during the conference was built within the schedule. Talk about work life balance! During the conference, a 5k walk event occurred around the mesmerizing Indianapolis Canal. 5. Gain skills to then go back home and make a change to my life and to the lives of others: I am grateful to have a roommate who is a medical student, Kacie Amacher, and also attended the conference. We are both passionate about helping others live a healthier life. Most importantly we realize the importance of the change first having to start with our own habits and routines. 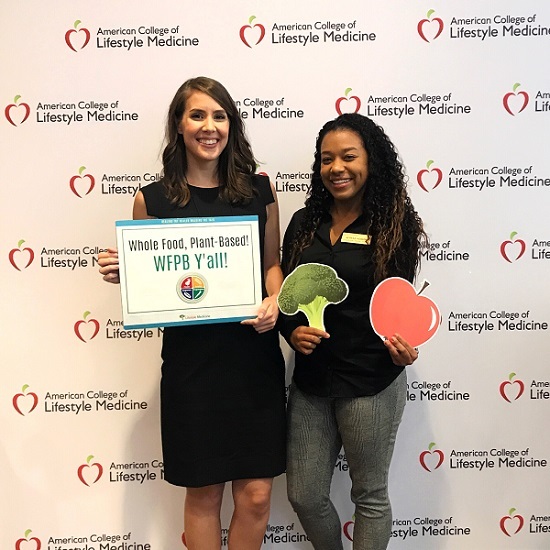 Me and my roommate, Kacie Amacher, at the 2018 American College of Lifestyle Medicine Conference. During your own OT journey, whether it be before, during, or after your academic career, I would highly suggest attending a conference related to your interests. Especially an interest where you feel OT may belong but lacks a wide presence. If you have any questions at all about ACLM and OTs involvement please feel free to contact me! MORELIFE: Preventative Health Access Program. No, Not the Drake Album. This semester I was enrolled in Occupation-Centered Programs for the Community taught by Dr. Jenny Martinez. 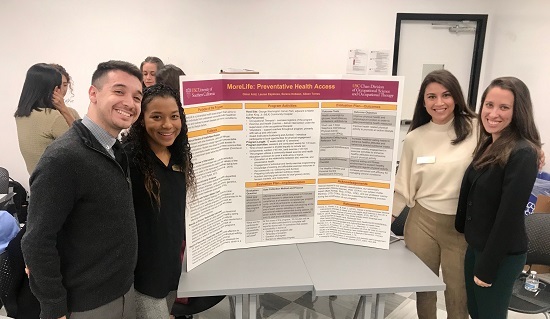 In the class I paired up with 3 of my colleagues to create a community project around a topic that interested all of us: access to preventative healthcare. We all had a specific passion for delivering client-centered care, specifically focusing on culturally appropriate interventions for the Latino and Black communities in Los Angeles. Presenting our project, MORELIFE, at the end of the semester. Working with them was a joy since we all desired to address the current health disparities in Los Angeles. My team and I created a proposal for our community program, which we called MORELIFE: Preventative Health Access. The proposal included all the necessary components that would be required to start a new service. Thus, over the 16 week semester, we developed a trends analysis, needs assessment, literature review, marketing plan, mock funding request, and program evaluation. At the end of the semester, we delivered a presentation to our classmates, staff, and faculty members in the USC OT program. It may seem like a lot of work because it was a lot of work (lol); however, we received continuous guidance and support from our professor, Dr. Martinez who we met with weekly and other faculty members such as Dr. Stacy Niemiec who so generously shared her experience in developing a very similar program, ¡Vivir Mi Vida!. Since undergrad, I have always wanted to create and then deliver a community project focusing on health disparities so by gaining these skills I am one HUGE step closer to implementing a program like MORELIFE into society. During the end of the semester presentation, I eagerly presented on the program my 3 colleagues and I had been working on for the entire semester. What does a USC OT graduate school class look like? In our program, it is truly all about work-life balance. As we near finals, our Health and Wellness Professor, Dr. Dieterle created an activity that allowed us all to engage in a novel or relaxing occupation while in class. My classmates and I had the ability to choose two activities to participate in for our 2 hour class. 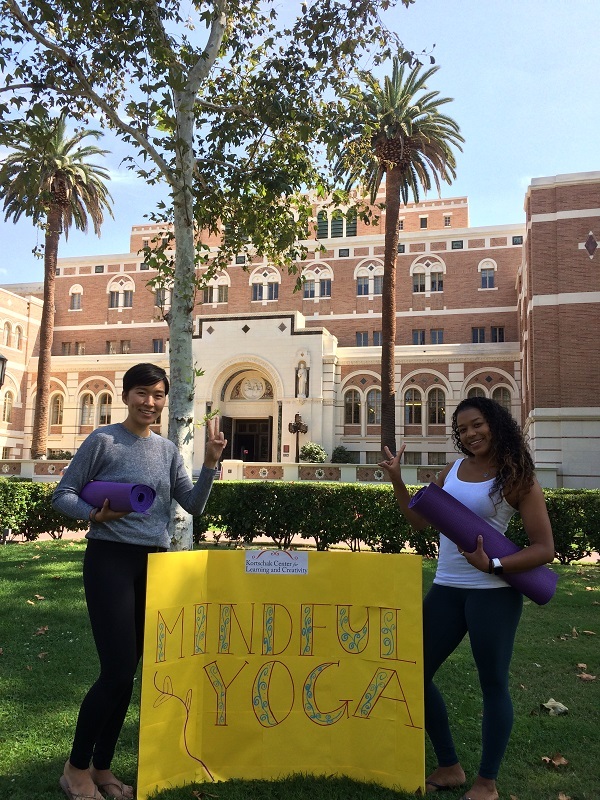 The options were salsa dance, meditation, Yoga, or arts & crafts. As you can see from the video, I selected salsa dance led by two OTD students and a meditation seminar led by Dr. Payne. In the salsa dance class, the OTD students taught a partner routine. Then we all performed the routine with a partner. My lovely partner of the day was Melissa. Once we became familiar with the routine, we then switched partners so we danced with nearly every person in the room. I was incredibly impressed by my very talented classmates. The OTD students were taking song suggestions (very client-centered) so I requested “Mi Gente” (the remix of course with Beyoncé), “MIA” by Bad Bunny featuring Drake, and “Taki Taki” by Dj Snake featuring Selena Gomez, Ozuna & Cardi B. We also took it back to the early 2000s and listened to “Beautiful Liar” by Shakira and Beyoncé. However, the song of the day was “I Like It” by Cardi B featuring Bad Bunny & J Balvin. Well now that I have laughed and released some stress in the Health and Wellness course, its time to get back to studying for finals! What a great turn out at this year’s 5th Annual Latino College Expo™! What is the Latino College Expo? Mostly comprised of high school and middle school Latino students, the event had recruiters from higher education (like me) and positive post-secondary pursuits (like recruiters from Disney Animation). The event had resources on grants, loans, and the Dream Act; additionally, information on internships and career opportunities were given. What did I do at the event? 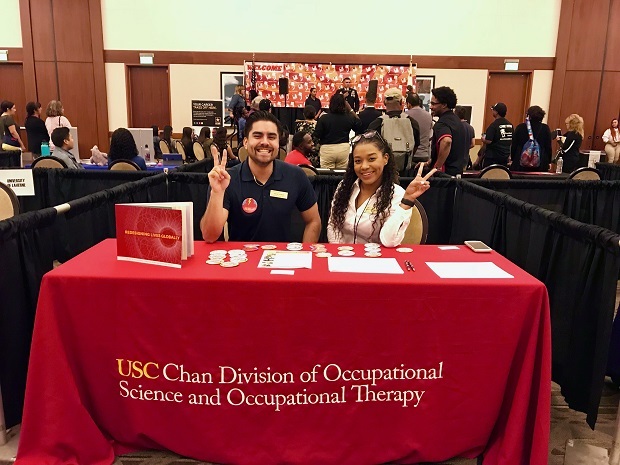 While raising awareness about USC’s OT program with Diego Lopez, an occupational therapy doctorate (OTD) student, we spoke to over 300 high school students and even middle school students, (yes 8th graders :0) about OT. I wish I would have known about OT when I was in 8th grade! It was such an incredible sight to see so many young students not knowing what OT was but then realizing that their unique interests could be found in OT. For example, there were students interested in design and mechanical engineering and they realized that they could become an OT focusing on helping individuals live a more meaningful life by designing more functional prosthetics. Other students with a desire to pursue a major in criminology came to learn about OT’s role in forensic mental health and OT’s ability to work in the criminal justice system. 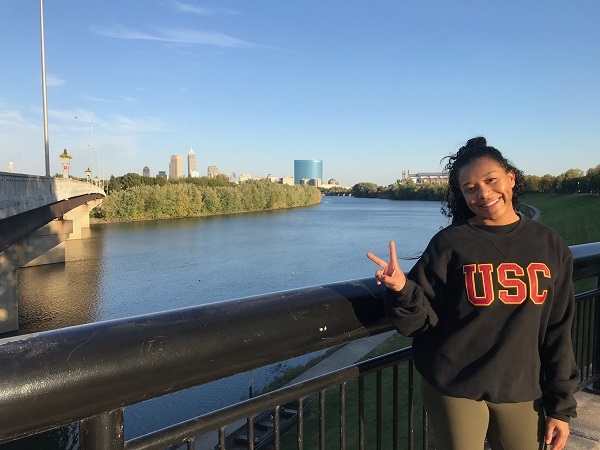 Given the age of the crowd, the middle and high schoolers were mostly interested in USC’s accelerated Bachelor’s to Master’s in Occupational Therapy program. They were amazed and thrilled to learn that they could receive their Master’s in just 5 years and their doctorate in occupational therapy in just one subsequent year! OTD student, Diego Lopez, and I educating high school and middle school students about USC occupational therapy programs at the 5th Annual Latino College Expo event in Pomona, California. The highlight of the event! One of the highlights of the event is when the host of the event came up to the USC Occupational Therapy booth and let me have the microphone! I was in utter disbelief. My face completely lit up! I was so surprised since I was the only booth she had given the ability to speak on the microphone in front of the ENTIRE crowd! You know I took full advantage of the opportunity! I politely yet firmly grabbed the microphone and proudly stated my OT elevator pitch with a huge smile on my face. I mean, the opportunity to spread awareness about the best profession in the world  to over 600 people does not happen that often. I am most definitely looking forward to attending the 6th Annual Latino College Expo next year. Maybe next time they will let me go on the main stage with the microphone! Stay tuned for a post about the 20th Annual Black College Expo, which will take place at the LA Convention Center on February 2nd. If you are a current USC OT student or alumni of the program, please message me if you would like to attend the event and help raise awareness about USC’s OT program! Free Yoga Classes! Yoga mats provided! Who can join? : Undergraduates, graduates, staff, & faculty are all welcomed. I am completing my Level I Fieldwork and Jennifer is completing her Level II Fieldwork at the USC Kortschak Center for Learning and Creativity (KCLC) under the mentorship of a previous student ambassador, Dr. Rashelle Nagata. As mentioned in my previous post, the USC KCLC is an academic support center that addresses challenges related to academic performance such as time management techniques, procrastination, self-care strategies, and stress management skills. Dr. Nagata is our wonderful Fieldwork Educator (FE). A FE, formerly known as a Clinical Instructor (CI), is typically an occupational therapist who mentors and supervises you during your FW experience. In the beginning of our FW, Jennifer and I worked together to build an occupational therapy informed yoga class that incorporated meditation, mindfulness, and gentle yoga stretches to provide a greater awareness of useful calming and alerting strategies that can be easily incorporated throughout the day. The yoga sessions, which are trauma informed, first begin with a mindful breathing activity, then leads into a guided meditation, and ends with gentle yoga stretches and poses. Throughout the session, aromatherapy and bells or Tibetan sound bowls are incorporated during session to bring greater awareness to the power of senses impacting a calm and alerting state. For example, we pass around lavender in the beginning to elicit a more serene vibe. Towards the end of the session, peppermint oil is offered to those wishing to return to an environment that requires a more alert state of being. We end with the sound of bells or Tibetan bowls, which have healing benefits such as decreasing stress and anxiety. If any of this speaks to you, we would love to have you at the next class! There are only 2 more sessions so hopefully I will see you there! 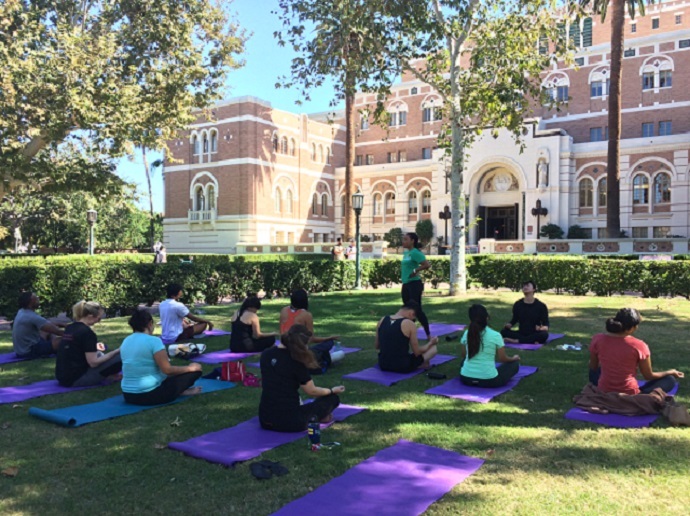 The yoga group comprised of undergraduate, graduate, staff, and faculty members performing gentle yoga stretches in front of Doheny Library on a beautiful sunny Southern California day!